French football stadiums need tighter security controls before Euro 2016, says the country's sports minister. 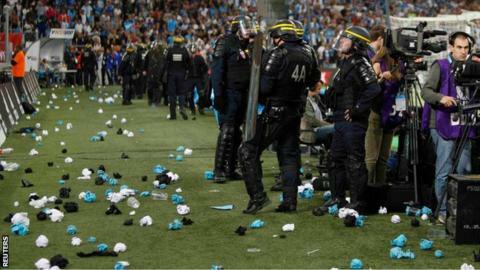 Thierry Braillard called for tougher measures after Marseille's home draw against Lyon was stopped for 20 minutes when supporters threw missiles. "It's unacceptable and I think we need to stand more firm on the security checks," he said. "We're six months away from the Euros and I'm urging everyone to take the measure of what happened." Lyon midfielder Mathieu Valbuena was targeted by hostile home supporters as he made his first appearance back at Marseille since leaving in 2014. The 30-year-old France international ended his eight-year stint at the French club by joining Dynamo Moscow last season for what some Marseille fans thought were financial reasons, before moving to Lyon in the summer. Home supporters hung an effigy of the player, unveiled a banner which denounced him as a traitor and then threw glass bottles towards him during the second half. "There are security conditions that need to be respected, you cannot have glass bottles in the stands," added Braillard. Clubs whose home games are marred by crowd trouble should now face tougher punishments, according to French Professional League president Frederic Thiriez. He suggested it was time for the French league to consider handing out increased fines and possible points deductions. Euro 2016 takes place in France between 10 June and 10 July next year. Marseille's Stade Velodrome is one of 10 stadiums which will host matches.